Join us in our commitment to turn childhood dreams into reality by supporting THONTM. Together, Chelsey Bunner and Megan Reese are taking action by uniting with 16,500 student volunteers and over 25,000 alumni supporters in the fight against childhood cancer. Our year-long efforts culminate in a 46-hour, no-sitting, no-sleeping dance marathon each February to celebrate our survivors, remember those we’ve lost, and take a stand--all in hopes of one day dancing in celebration of a cure. We have been working tirelessly all year with the hopes of being selected to dance in THON 2019. 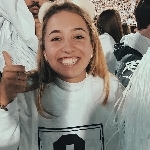 As an Independent Dancer Couple, we have committed ourselves to setting up our own fundraisers throughout the year, and with the support of our friends and family, we will obtain tickets in a lottery system, in the hopes of earning a spot as dancers in the 2019 Penn State Dance Marathon. With your contribution, you will bring us one step closer to being able to take a stand against childhood cancer during THON Weekend 2019. Our THON Story: We met last year through our involvement in THON. The two of us participated in a Special Events Committee and became very close THON 2018 Weekend. We soon realized that our goals and aspirations for our THON involvement closely aligned. This past spring we were both selected as 2019 Donor and Alumni Relations: Alumni Engagement Captains. We have dedicated our time to building relationships with alumni and appreciating their constant support of Penn State Dance Marathon. However, we are not quite finished. We decided we wanted to take it one step forward and show our support For The Kids on foot, by standing 46 hours this coming February. Our motivation comes from our love of Penn State, Four Diamonds, and the endless opportunities THON provides to build friendships just like ours.